If you’re looking for luxury and elegance on your next holiday then Turkey is the place to find it. With miles of stunning coastline, brilliant sunshine and world-renowned 5* All Inclusive hotels, it’s no surprise that Turkey has a buzzing tourism industry. The Turkish people are also known as being some of the most hospitable in the world, and this is demonstrated in the warm welcome and exceptional service you’ll receive in the hotels. You’ll get nothing but the best at these All Inclusive complexes, with deluxe rooms, delicious restaurants and stunning views of the Mediterranean Sea. There’s a fantastic selection of All Inclusive hotels across the coastal regions of Turkey, and if you’re looking for a holiday full of extravagance, Turkey will not disappoint. Stumped on where to stay on your next Turkish holiday? Here’s a list to help pick your Turkey All Inclusive hotel. This magnificent 5* All Inclusive hotel, located directly on the coastline, was completely refurbished in 2014. You can spend your days sunning yourself on the loungers around one of three outdoor pools, or relax in your own private cabana on the seafront. This hotel also has a rejuvenating health and beauty spa complete with sauna and Turkish bath, just in case you weren’t relaxed enough. Luxurious and elegant, this hotel will make you feel like royalty. Away from the hustle and bustle of the city of Alanya, and set on a gorgeous peninsula, this hotel boasts a quiet ambience with relaxation at its heart. The accommodation itself is glamorous and built in an eye-catching globe-shaped building with views over the glittering blue sea. Struggling to unwind? The Island Aqua Spa will calm your senses with its Thai massages, steam baths and aromatherapy treatments. Modern and sleek, the All Inclusive the Champion Holiday Village prides itself on being up to date, with satellite cable TV and hot tubs in their deluxe rooms. You’ll get excellent views of the Taurus Mountains from this resort and have your own private beach directly outside the hotel, with unspoilt stretches of sand and plenty of room for your sun lounger. Surrounded by beautiful gardens, this hotel is split into two sections, one for adults only and the other for families. For the kids there is a fantastic waterpark with winding slides attached to the outdoor pools, while adults can chill out on their own private area of the beach – strictly restricted to guests over 18. The hotel’s restaurant selection is vast, with two buffet eateries and eight a la carte restaurants. Situated directly on a Blue Flag winning beach and opposite a mini bazaar, the All Inclusive Pegasos Royal beats the competition when it comes to location. Plus, the massive waterpark outside the hotel – with 16 spectacular slides – is a child’s dream come true. You can also use the facilities of the neighbouring hotels, Pegasos Club and Pegasos Resort for no extra charge when you stay here. The Barut Kemer enjoys a spectacular mountain and Mediterranean Sea backdrop, which you’ll be able to admire from a sunlounger on the hotel’s stretch of private beach. This All Inclusive accommodation is just a 10-minute walk from Kemer’s eclectic array of shops, bars and restaurants, but if you want to stay within the complex there are six restaurants to choose from, serving Turkish, Italian and Mediterranean influenced dishes. Renovated in 2015, this elegant hotel has spacious beach-front rooms with incredible views. 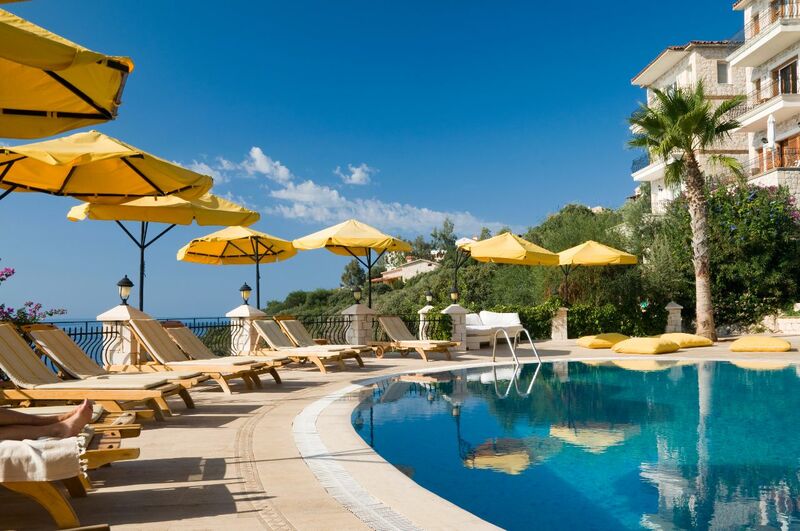 With activities for adults and children including tennis courts, mini-golf, an extensive outdoor pool overlooking the sea and a popular day spa with sauna, Turkish bath and array of exfoliating treatments, there’ll be no chance of getting bored. In the evening the fabulous entertainment team put on live shows, music and beach and garden parties. This All Inclusive hotel is the height of luxury, with four pools complete with waterslides and whirlpool jets and four restaurants serving international and traditional Turkish meals. The interiors are stylish and sleek with real wood flooring and floor to ceiling windows, with a glass canopy holding it all together. The service here is incredible and staff will go above and beyond to keep you happy. This hotel is currently being refurbished, with work due to finish in May 2016. As its name suggests, a beautiful palm-tree-filled garden surrounds the grounds, enclosing the traditional Turkish style architecture. The outdoor pool is fitted with children’s slides and a splash zone, and during the day, there are endless sports and group activities for you to take part in. Located between pine tree forests and the Mediterranean Sea is the 5* Rixos Tekirova. You’ll never go hungry here, with six restaurants serving everything from Turkish to South American cuisine. This hotel is big on watersports with two aqua parks – one for adults and one for children – and sailing, scuba diving, water skiing and windsurfing along the coast. If we’ve left you feeling the need for a little Turkish luxury, take a look at our deals and snap up a bargain for your next holiday.